"... Teva Pharmaceutical Industries Ltd. plummeted the most in six months after U.S. sales fell amid price erosion for generic drugs, the company’s biggest business. 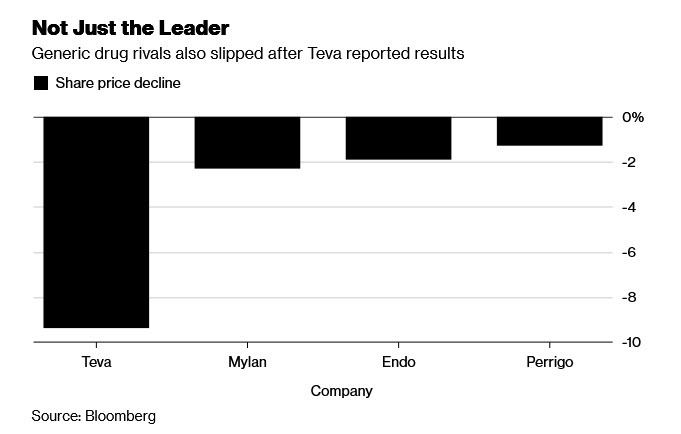 The 18 percent slump in overall second-quarter sales to $4.7 billion trailed analysts’ average estimate and was led by a decline in sales of copycat drugs in North America. Rapid approvals for generic medicines and consolidation of big pharma buyers continued to squeeze industry profitability for a second year..."